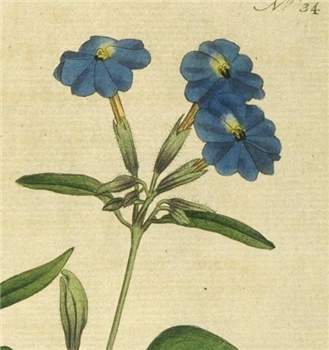 Flowers of Browallia elata from Curtis, Botanical Magazine 1, t. 34 p.p. (1788). Browallia L., Sp. Pl. 2: 631 (1753), & Gen. Pl. 5th edn, 278 (1754); after John Browal (1707–1755), Bishop of Abo, Sweden, who was a magistrate, botanical writer and a friend of Linnaeus. Type species: B. americana L.
Erect, branching herbs to 1 m, glabrous or pubescent with simple and glandular hairs. Leaves usually alternate, sometimes paired, simple, entire, petiolate. Flowers solitary, axillary, bisexual, zygomorphic. Calyx tubular, 4–5–lobed, the lobes triangular to oblong. Corolla salver-shaped, white or blue; tube swollen at apex but contracted at mouth; limb 4–5–lobed, the lobes induplicate in bud. Stamens usually 4, inserted in upper part of corolla-tube, paired, a staminode or 5th stamen sometimes present; anthers bilocular, not cohering, basifixed, dehiscing by longitudinal slits. Ovary bilocular; stigma expanded. Fruit a capsule, opening from apex, enclosed by calyx. Seeds prismatic. A genus of two species [Hunziker (2001) suggests c. 6 spp], native to Central America and tropical South America, but widely grown in other parts of the world as ornamentals. One species naturalised in Australia. W.G. D'Arcy, Flora of Panama, pt IX, Solanaceae, Ann. Missouri Bot. Gard. 60: 576–582 (1973); D.E. 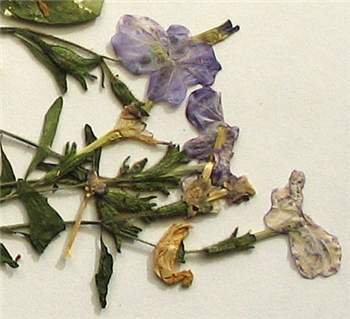 Symon, The solanaceous genera, Browallia, Capsicum, Cestrum, Cyphomandra, Hyoscyamus, Lycopersicon, Nierembergia, Physalis, Petunia, Salpichroa and Withania, naturalised in Australia, J. Adelaide Bot. Gard. 3: 133–166 (1981). Only Browallia americana is known as an escape from cultivation in Australia.